Some days are diamonds, some days are gold. Our meeting on Saturday 23rd August was both. There is a growing awareness that sound, and music in particular, is even more important than we believed. A baby in the womb can already hear half way through a pregnancy. And they say hearing is the last thing to go when we are dying. In between the two we hear and discover a great deal, and one of the many exciting things we learned on Saturday was the effect that sound can have. Some 2,000 to 4,000 years ago, Perpetual Choirs comprised of early monks, saints or druids, maintained ceaseless chanting on a rolling rota basis, 24/7, for the ongoing enchantment of Britain. Each choir consisted of 2,400 men, a 100 of them for every hour of the day and night, so their area of influence was massive. The energy lines or ley lines across the land would respond to their chanting, which brought balance and harmony. These energy or ley lines still exist today, and are easily found by dowsing. They appear to link various sacred sites and one of them passes right beside Slimbridge Church, probably en route from Gloucester cathedral to Glastonbury Abbey. After a fascinating talk in the village hall, our two speakers, Susan Hale and Ian Woodcock, led us across the road to the Church for an experiment. First we were asked to dowse the width of the energy line. We all agreed it was approximately 30 feet wide. Then they led us in chanting and singing for some time. That alone was uplifting, but afterwards, we were invited to dowse the energy line again - and it had more than doubled in width! 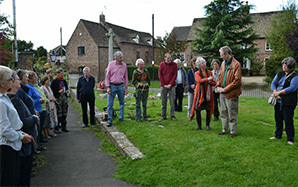 Slimbridge Dowsing Group in Slimbridge churchyard, singing the lines and dowsing the result. Had our energy, our singing and our uplifting communion with each other, really augmented the width of the line? We were in little doubt - unless you have a better explanation? After that, just to make sure, we planted a herkimer ‘diamond’, a tiny semi-precious double-terminated (or double pointed) quartz crystal that will help the energy continue to flow throughout the earth. Several of us agreed it was one of our best meetings ever, a positive jewel in our crown, and an experience worth rubies. Our next meeting will be on Thursday 11th September when Keith Harmon gives a talk titled “Go with the Vibes”.